Podolsk.ru has published the sad news that on April 25, 2018, the Russian equestrian champion Xenia Ryabova died in the local hospital of a heart attack. OrthoChristian.com recently featured Xenia in a three-part series. Xenia Ryabova suffered with cerebral palsy from childhood. But with her extraordinarily strong spirit and will to live a fruitful life, she became journalist and artist, a wife and mother of two, and for 20 of her 44 years of life rode horses in competitions, winning a number of prizes. 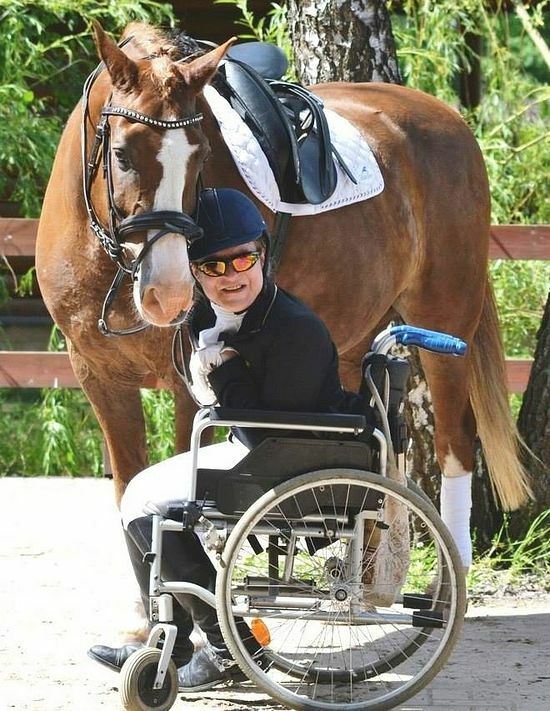 Her most recent aspiration was to prepare herself for the Russian Paralympic championship, become a member of the Russian team and gradually move towards the summer games in Tokyo. Despite her fame, Xenia’s family is currently in such want that they are having trouble collecting the money for her funeral. Her husband, Constantine Vorotnikov, is also disabled with cerebral palsy. An organization in the neighborhood where she last lived, in the industrial town of Podolsk just south of Moscow, has been collecting money for the family. Memory eternal to this giant of spirit, Xenia! We ask our readers to pray for the repose of her soul, and for strength and help to her husband Constantine, and children Vasilisa and Yakov.